Centrally located and near beach. The apartment was perfect for a family of six. Location and kitchenette. Receptionist was on top of it. Fresh fruit at breakfast! And very nice personal attention from the personnel!! The value for money is the best in the region and the island. Large apartment so 5 people was not cramped. Bars and restaurants local and not far from beach. The staff was friendly and helpful. Also the bathroom had a nice shower with lots of warm water. 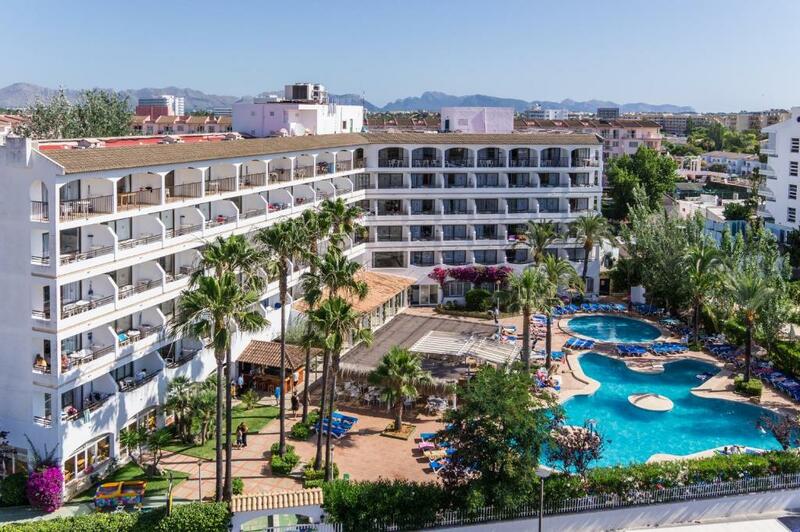 Sol de Alcudia Apartamentos This rating is a reflection of how the property compares to the industry standard when it comes to price, facilities and services available. It's based on a self-evaluation by the property. Use this rating to help choose your stay! One of our top picks in Port d'Alcudia.Located 1,650 feet from Alcúdia Beach, this modern apartment complex offers a large outdoor swimming pool, a garden and a sun terrace. Each bright, spacious apartment has a furnished balcony. The air-conditioned apartments have tiled floors and wooden furniture. The small kitchen includes a hob kettle, coffee machine and microwave. Bathrooms come with a hairdryer. Safes are available for rent from the 24-hour reception. Free Wi-Fi is available. Sol de Alcudia Apartamentos are located in Port d’Alcúdia, 1.6 mi from Alcúdia Old Town. Buses to Port de Pollença and Palma stop just 1,300 feet away. Free parking can be found nearby. The complex has a poolside bar and a restaurant. You can also find many shops and restaurants within a 5-minute walk. When would you like to stay at Sol de Alcudia Apartamentos? Featuring a private balcony with mountain views, this air-conditioned apartment includes a lounge with satellite TV, sofa bed and a kitchenette with a microwave, coffee machine, kettle and fridge. There are 2 twin rooms. There is free WiFi. A safe is available at an extra cost. Featuring a private balcony with mountain views, this air-conditioned apartment includes a lounge with satellite TV, 2 sofa beds and a kitchenette with a microwave, coffee machine, kettle and fridge. There are 2 twin rooms and a single room. There is free WiFi. A safe is available at an extra cost. Featuring a private balcony, this air-conditioned apartment includes a lounge with satellite TV, 2 sofa beds and a kitchenette with a microwave, coffee machine, kettle and fridge. There is 1 twin room and a bathroom. There is free WiFi. A safe is available at an extra cost. 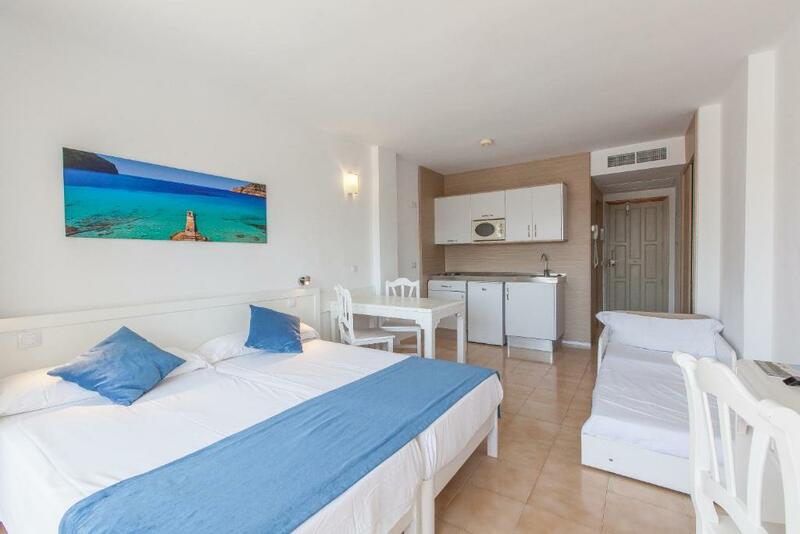 Featuring a private balcony, this air-conditioned studio includes a lounge with satellite TV, 2 single beds, sofa bed and a kitchenette with a microwave and fridge. There is free WiFi. A safe is available at an extra cost. 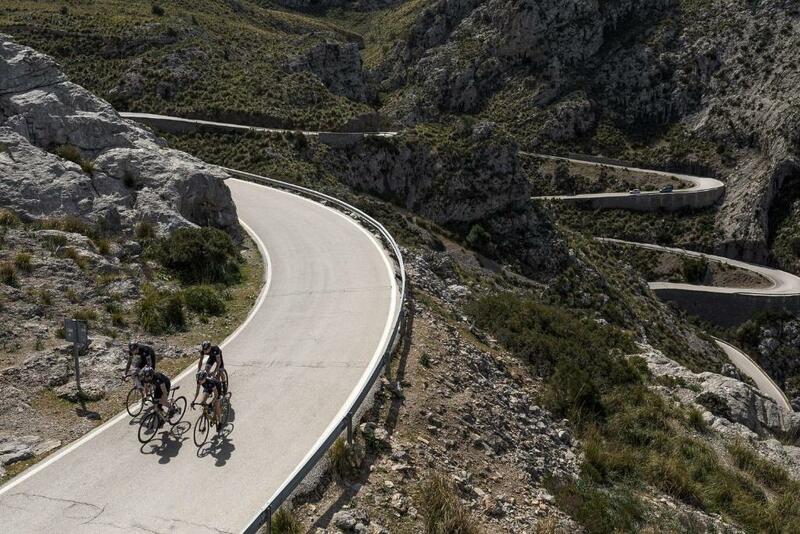 - Information about routes and itineraries for cyclists. Apartamentos reformados y muy familiares. Nuestra política es la de brindar el mejor servicio y de que el cliente reserve nuevamente con nosotros. Muy cerca de la playa. A unos 10 minutos caminando. En el corazón de la zona turística del puerto de Alcudia. Rodeado de tiendas, bares y restaurantes. House Rules Sol de Alcudia Apartamentos takes special requests – add in the next step! Sol de Alcudia Apartamentos accepts these cards and reserves the right to temporarily hold an amount prior to arrival. 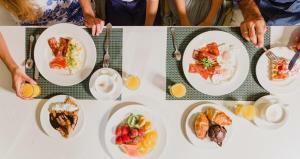 Please note that guests must present the credit card used to make the reservation on arrival and that the credit card holder must be present upon arrival. Please note that the property requires an DNI number or Passport in order to provide an Invoice per stay. We came in October 23-30. There was supposed to be some animation for small children, but it was not. I did not like that there were playing automates for children at the pool area. The furniture in the living room was very old, sofa there is not comfortable, kitchen facilities are too limited. One bedroom is very small and dark, with small window under the ceiling. There are two buildings. One is probably older, it is where we lived. Surrounding was not really good. Too many touristic shops, the closest food shops are too expensive and do not offer a choice of goods. Safe costs 3 euro per day. We live in 2-bedroom apartment. It was big enough for our family with 3 adults and 2 children, cleaning was regular and good. In each bedroom there was big wardrobe. The Balcony was big also. When we had any problems the personnel was helpful and friendly. We did not eat breakfast in hotel. It is close to the beach. Like 10 minutes walking with small child and old lady with us. Small Public Child playground just opposite to the hotel. Free public park place near the entrance. Reception staff could use a course in service. Signs promised mini disco in the evening but when we asked there wasn’t any due to low season. No problem but please don’t promise things to the kids you won’t provide. Location was close to restaurants and super markets. Pool area was nice as well as restaurants. Comfy bed and well equipped kitchen. Restaurant and cleaning staff was great with the kids. Swimming pool, gym, fully equipped kitchen, tv, air conditioner, towels and cosmetics in bathroom. The drain smell in the bathroom and around apartment block. We left an expensive pair glasses in the changing room upon leaving and they have thrown themaway!! The apartment wasn't very pleasant smelling, neither was the hallway. The bed sheets had yellow stains, as well as the towels. Eating utensils were dirty with yellow grime on them. The nights were quite cold (we visited in mid-October) and the air-conditioning was set to work on cooling only. The sofa was extremely uncomfortable so very difficult to relax in the evening - we went with very small children so having a comfortable sitting area was important for us as we didn’t stay out late in the evenings. The beds also uncomfortable. All 3 adults found this to be the case. Also, the Towels were very old and quite worn out so not pleasant to use. The receptionist Maria isss WOW!Such a nice lady and help a lot with all the questions in regards to the apartment and also reserving a tour. The noise. Every night High noise from entertainment in the bar. Terribel until 12 pm.every Day was mutch to mutch for us. Good that we do not have children with us. Only a very few of the customers were participating. We could not sleep before 12pm any of the days. Near the beach. Near shops and restaurant.nice and clean appartment. the rooms are very basic and some parts falling apart, we had a broken toilet seat and the cleaning is just ok, certainly not much time taken to clean the rooms and even if you request the maids to not come in one day, they still do!! a little privacy would be nice sometimes. the staff especially Maria :-) we see her every year and she always remembers us :-) the food is great and so easy to check in. nice, small and friendy hotel. big balcony, room for bicycles near reception.